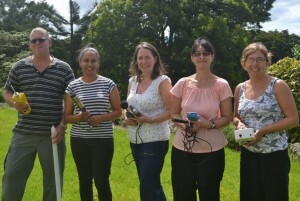 Kath Thorp (pictured, centre), from the Company AECOM was on St Helena from 6 to 21 February 2016 as an Environmental Trainer. AECOM – had been awarded a contract to produce an Environmental Monitoring Technical Field Manual for St Helena and deliver associated on-Island training – as part of a Darwin Plus Funded Project. The project – entitled ‘St Helena Baseline Assessment: A Foundation for Effective Environmental Management’ – aims to establish an environmental baseline for the quality of the Island’s air, soil and water. The project has enabled the Environmental Management Division (EMD) to purchase monitoring kit to measure these parameters at various monitoring points which will be set up around the Island. Supplemented with staff training, EMD will now be able to use this monitoring equipment. This is a new area for EMD and has become a statutory requirement under the Environmental Protection Ordinance. Kath mainly worked with EMD, but staff from the St Helena National Trust, Connect St Helena, Public Health Lab and ANRD also attended some of the training sessions. The sessions covered air quality, surface water quality, hydrology and marine monitoring, and noise monitoring. Kath delivered a good balance of classroom-based and fieldwork sessions to develop delegates’ self-assurance in using the equipment. EMD will now establish a monitoring network which will take baselines of St Helena’s environmental quality and compare this with future changes. This will enable the development of remediation plans or mitigation plans to manage any negative impacts.